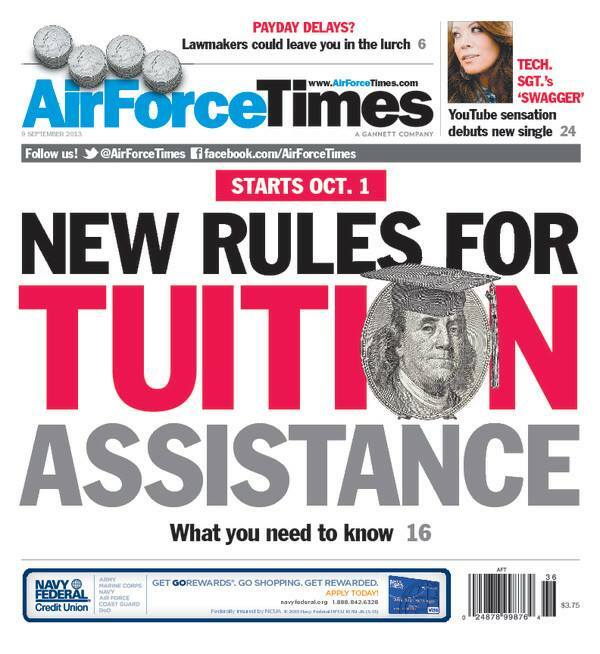 Starting Oct. 1, new rules will be in place for tuition assistance. In this week’s Air Force Times, we explain how they affect you. Also this week, a Predator and C-130s are helping with efforts to combat the Rim Fire near Yosemite National Park. You can read how the aircraft are being used to fight the huge blaze. In somber news, the report into the April 5 fatal crash in Afghanistan has been completed and determined what caused Capt. James Steel’s F-16 to go down. Steel is son of retired Maj. Gen. Robert Steel, a former commandant of the National War College. Meanwhile, a military court-martial has sentenced the Army major convicted in the 2009 Fort Hood shooting to death, but what are the chances that the sentence will actually be carried out? We tell you the five things you need to know about the death penalty in the military. And, airmen are fuming about the Air Force’s recent decision to give those who pass the waist measurement part of the PT test but pass the situp, pushup and run portion of the test a second chance. Read what they have to say about the Body Mass Index measurement.